Thank you, Meher Baba, for helping me to see the One behind the many faces of your Love. When I saw the following notice in the St. Paul’s Episcopal Church Bulletin, I was intrigued and decided to participate. At the spiritual gathering to celebrate the Divine Mother I shared several of the 1942 Pentecost Novena poems by Edith Stein. In 1998, Edith Stein became Saint Teresa Benedicta. Her statue outside St. Peter’s Basilica in Rome depicts her holding both the Torah and the Cross. A convert from Judaism, she died a martyr in Auschwitz in 1942. In my online research of Edith Stein, I was very moved by the 1998 canonization speech of Pope John Paul ll. The story of Carmellite nun St. Teresa Benedicta is a reminder of the trials and the suffering in Christ, and also of the joy and unity in faith. In our age, Avatar Meher Baba as the Christ also gives his devotees an opportunity to share in these aspects of His Advent. At the Divine Mother Celebration, we made wreaths of flowers to wear and sang Catholic devotional songs. 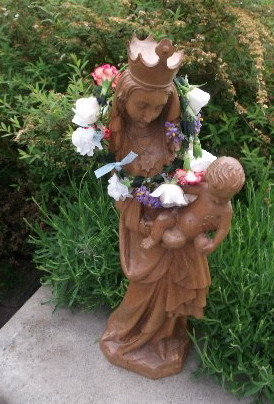 Some of the women in the gathering were raised in the Catholic Church and so they decided to have this celebration as their way to honor the Crowning of Mary. I invited friends from other spiritual backgrounds and they also joined the celebration. Shekhinah, considered the feminine aspect of God in the Jewish faith, was recalled and mentioned by me at the gathering. Through the Jewish Renewal movement and other sources, Shekhinah is now more widely known and studied. (As a young woman, my interests led me to research this aspect. At the C. G. Jung Center in Los Angeles, I recall making a zerox copy of a book called Sexual Symbolism in Religion, circa 1977. In the book there were many spiritual references to Jewish female imagery). 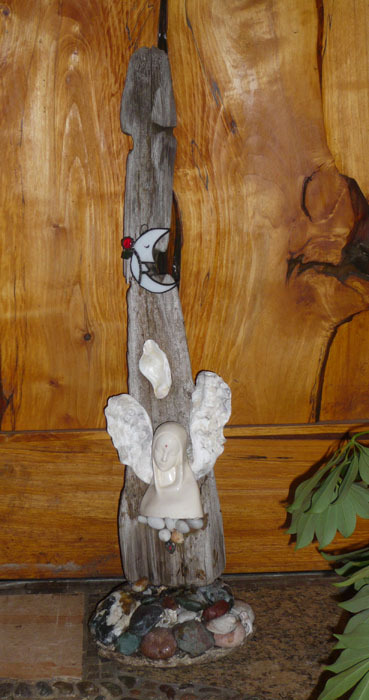 For the women’s gathering my friend Jane McKann brought her statue with an image of Mother Mary, surrounded by shells and stones in a natural wooden setting, Jane was inspired to create the art piece to honor her experiences of motherhood. Jane calls her statue The Great Mother. My friend Helma Gumpp brought her statue of the Virgin Mary and Baby Jesus to the gathering. The statue is originally from her family home in Munich, Germany. Inspired by the music, the devotional singing and the various images of the Divine Mother that women brought for the gathering, I danced on the outdoor labyrinth courtyard.